One moron at the DCCC recruited Frick to run in CA-48 (the Orange County coastal district) against Dana Rohrabacher. And then DC said "no, no, no; we want Frack; we must have Frack." So everyone was stuck with two candidates, 2 centrists who were both endorsed by the New Dems. The DCCC worked hard to persuade other Democrats, particularly self-funders Gil Cisneros and Ma-Khanh Tran, to run somewhere else; both ran in CA-39 instead, although both live in CA-48. Cisneros, a worthless Republican pretending to be a Democrat, transferred $3,552,762 from his personal bank account into his campaign, while Tran spent $730,000 of her own cash. Another random carpetbagger spent $2,785,900 of his own loot on the race. Meanwhile, back in CA-48, which runs from Seal Beach through Huntington Beach, Fountain Valley, Costa Mesa and Newport Beach down to Laguna Beach, Laguna Niguel and Three Arch Bay, Frick kicked in $1,130,500 of his own, while Frack disappointed the DCCC by only ante-ing up a mere $730,400, even though he's very wealthy. The DCCC was so pissed at him that they released some filthy opposition research to kill his chances and quickly endorsed Frick. The race was so close that the lead kept swinging back and forth for over 2 weeks until Frick finally won a spot in the general election... by 70 votes! This appears to be the final count, by who really knows? I might add that two progressive candidates, Laura Oatman and Michael Kotick, quit early and both endorsed Frick. It was too late to get their names off the ballot and despite urging their fans to vote for Frick, they still got 3,165 votes between them (3.02%). "I am deeply grateful for the confidence placed in our campaign by the voters of California's 48th Congressional District. I'd like to thank all of our supporters, volunteers, neighbors, elected leaders, working people, grassroots activists and those who joined our effort in this important election. This victory is a testament to the movement we have built around moving Orange County forward. I congratulate all the fine candidates who ran hard-fought campaigns in this primary and look forward to working with them all to flip this seat in November. In the days and weeks ahead, I will continue fighting every day to hold Dana Rohrabacher accountable for his reckless, backward agenda that spans from Orange County all the way to Washington. Frick! Frick! Frick! Will he consolidate the Democratic vote and send Rohrabacher to some lobbying firm to represent the Kremlin? I think so. And here's what Frack said when he realized the $730,400 was a total waste... and by just 70 votes; there's no prize for "almost." But what a selfless candidate!! "A year ago," he wrote, "I decided to run for Congress to bring science and facts back to Washington. I’d watched Dana Rohrabacher deny climate science for too long-- I couldn’t sit by as Donald Trump marginalized science across his entire administration." Wow! Frack, Frack, Frack... so selfless! Frack, Frack. [W]e’ve built a powerful organizing movement from the ground up and sparked a spirited debate here in the 48th District. I know that if Democrats keep building on this momentum, we can flip the 48th in November. After weeks of tireless work to ensure every ballot was counted in our primary, I congratulate Harley Rouda on advancing to the general election to finish the job. I know that the Rouda campaign values the importance of science and facts in public policy. Harley will fight to fix our broken health care system, stop climate change, and represent ALL of us in Congress-- regardless of our background, our immigration status, where we worship, or who we love. I wholeheartedly pledge my support and look forward to working alongside Harley to make sure Democrats prevail in November. [I]t’s been an absolute pleasure to meet so many hardworking and passionate people in our community. I want to thank you sincerely for working your hearts out for what you believe in. While we may not have advanced to the general election, you should be proud of what your work helped achieve. Together, we’ve restored science and facts to political debate. And together with every Democrat who knocked on doors, made calls, and cast a vote on June 5, we’ve made it clear that we have what it takes to flip the 48th. I look forward to continuing to work toward making change in Washington-- just not as a candidate. I hope you’ll continue this important work, too. Thank you again for your support, Howard. Now, let’s get to work to defeat Dana Rohrabacher! Right on Frack! Frack! Frack! Frack! "Our nation faces an existential crisis, one that must be met by a Congress willing to challenge the current Administration for their failure to act lawfully and protect our democratic institutions from foreign interference. 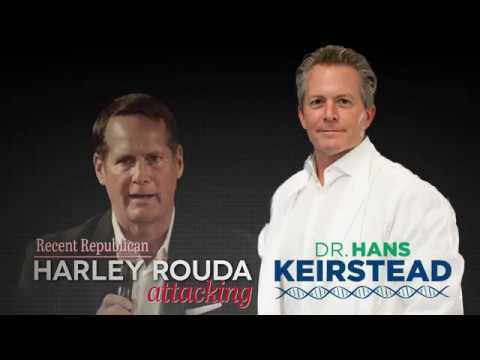 Harley Rouda is a principled and thoughtful leader who has the skills, compassion and persistence to be an outstanding member of Congress. I know that he'll fight tirelessly for better schools, a clean and safe environment, and a strong, thriving middle class economy in California. After a strong Democratic primary contest, it's time to unify and flip this district from Red to Blue!" One district over (CA-45), an actual progressive, Katie Porter won the primary-- against a Frick-and-Frack kind of primary candidate-- and is now trying to beat one of the worst Trump rubber stamps in Congress. If you want a bluer Congress, a bluer Orange County and a bluer California, please consider contributing to Katie's campaign here. In fact, you can find all the California progressive challengers who will be in the general election at that link. Does anyone else see this farce as a DCCC plot to save Rohrabacher's seat? Still think this is a party which can be reclaimed from within? we're being convinced that Mussolini is the remedy to hitler. and as of 2016 there were 65 million of us who were so stupid as to believe. And now that we clearly know that hitler 'is who he's always been', I bet even more of us will show up thinking that Mussolini is the only possible answer.